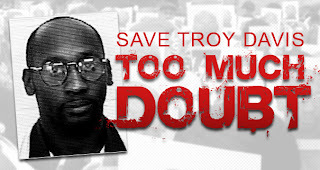 Hurt2Healing: What is your reaction and response to the updates regarding the Troy Davis case and the scheduled execution? Sharrieff Muhammad: I’ll say it like the Honorable Minister Louis Farrakhan says it. You can’t look for justice from a people who don’t have justice in their heart for us. Only Allah can give us justice. For twenty years they’ve been trying to execute our brother. It’s going to take Allah to intervene. He is the only reason they will stop this thing. I got a call from the Student Minister in Huntsville, Alabama this morning. Apparently there’s a pattern. He told me that there’s a brother, Derrick O’Neal Mason, who is scheduled for execution tomorrow night. 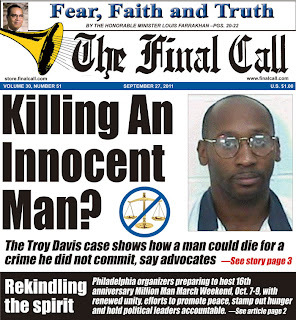 So tonight, if God doesn’t intercede, they’re going to execute our brother Troy Davis, and tomorrow they’re going to execute our brother Derrick Mason. However, there’s not a big outcry for the brother tomorrow night. Only God can intercede into our affairs. We must unite and do something for ourselves. That’s why I’m tying all of this, by the grace of God, into why we should go to Philadelphia on October 9th for the 16th Anniversary of the Million Man March. We need to hear what God’s Servant is going to tell us. We’ve got to have guidance from God’s man to deal with this situation. I think God is going to keep this going on until we unite and put a stop to it. We must unite. The key thing is we must unite under the leadership of the Honorable Minister Louis Farrakhan, straight up! That’s what time it is. Hurt2Healing: How are the believers in your city and surrounding cities protesting his execution? Sharrieff Muhammad: We were at the rally and protest last night. We were at the protest the night before. I have a couple of student ministers going to the execution tonight. We’ll be at the prayer vigil. I have brothers and sisters in Savannah tomorrow, because they’re having a big rally at the District Attorney’s office. By the grace of God, we’ve been doing our part as far as being vigilant. If they take our brother’s life, God is still Great and He’s still God. Just like the Honorable Minister Louis Farrakhan told us, “God works on both sides. God is a just God”. Remember this, if you don’t say anything I say, Allah (God) is a just God. Hurt2Healing: What words would you like to give our brother in this time as well as his family? Sharrieff Muhammad: On Monday, on a radio station here that reaches 4.1 million people, we tied in other radio stations from Alabama and Tennessee and we reached over 10 million people. We had Troy Davis’ sister as well as his attorney on the phone. I told them that the Honorable Minister Louis Farrakhan has them in his prayers. We, the Nation of Islam, are praying for them.